Keith Williams Architects enjoyed an enormously successful evening at the Civic Trust Awards ceremony at Cardiff City Hall on Saturday 9 March, picking 3 top awards in the Welsh capital. 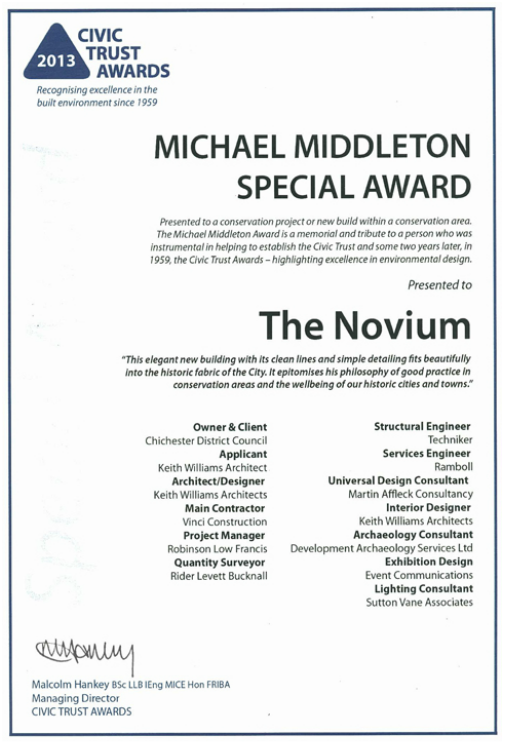 The firm’s recently completed cultural projects the Marlowe Theatre, Canterbury and the Novium Museum, Chichester both won Civic Trust Awards whilst the Novium also won the Michael Middleton Special Award for the best New Building in a Conservation Area. Since it was founded in 1959, the Civic Trust Awards has run continuously, making it Europe’s longest running architectural and built environment awards programme. It is also one of this country’s most important and prestigious. The Civic Trust Awards reward architecture or design excellence but also require that successful projects should also exhibit strong sustainability credentials, a high level of accessible and universal design, whilst also demonstrating how the project has provided a positive civic contribution. Keith Williams’ head of marketing, Vanessa Shrimpton accepted the awards on behalf of Chichester District Council, the client for the Novium Museum, whilst the clients for the Marlowe Theatre, collectively Colin Carmichael CEO and Janice McGuiness of Canterbury City Council along with Mark Everett, the Marlowe Theatre’s Director and Paula Gillespie the Marlowe’s Associate Director, attended in person to receive their award.